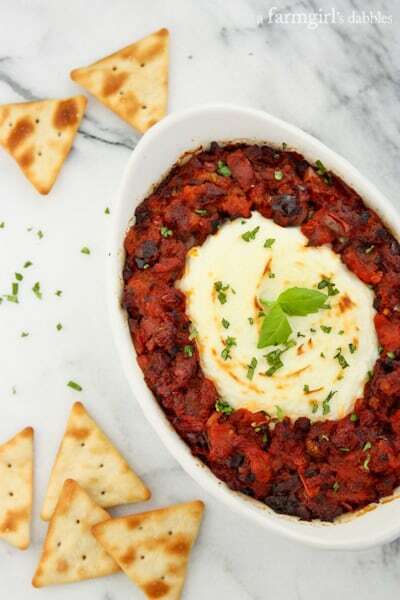 The oven does a little magic on this Baked Goat Cheese and Sun-Dried Tomato Dip, creating a cheese dip that’s wonderfully creamy and luscious. If you asked our youngest daughter what her favorite cheese is, she’d tell you goat cheese. Rich and creamy, with that irresistible bit of tang, it is one of her favorite indulgences. I regularly serve crackers with a small log of goat cheese, draped in a fruit or fruit and pepper spread, as an appetizer. And everyone goes crazy over goat cheese mingling with honey and fresh berries in this Sweet-and-Salty Honey-Cheese Spread. As I was browsing through the gourmet deli area at our local Kowalski’s during the holidays, a recipe card at the fresh olive station caught my eye. On it was a picture of a baked goat cheese dip, covered in a pickled pepper and apricot mixture. Right away, I thought of Tessa, and knew that I needed to try baking some goat cheese for her. And for me. But I didn’t think she would approve of the pickled pepper flavor. So this is my little rendition: Baked Goat Cheese and Sun-Dried Tomato Dip. It’s a good one! 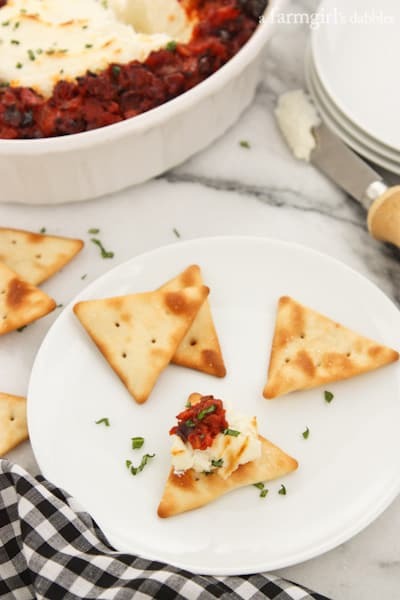 Mounded in the center of a small baking dish is the heart of this appetizer, a soft and silky mixture of goat cheese and cream cheese. The oven does a little magic on the baked goat cheese mixture, creating a cheese dip so wonderfully different than we experience when it’s eaten cold. I couldn’t resist blistering the cheeses under the broiler to finish it off. So pretty! Sun-dried tomatoes may be a few years of trends gone by, but I can’t help myself. I love them. They are a staple in our pantry, an ingredient that’s bursting with flavor and color. 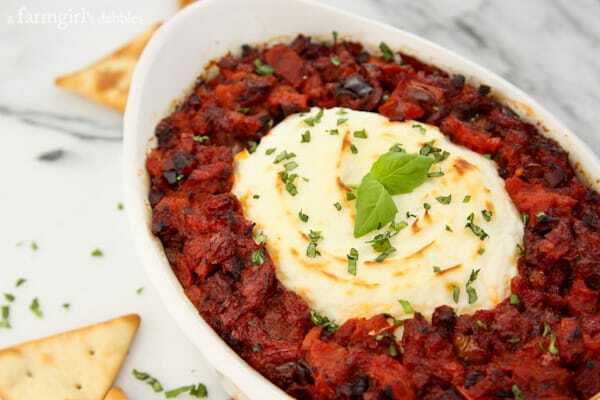 I combined them with diced fire roasted tomatoes and finely chopped Kalamata olives for an ultra simple marinara-esque accompaniment to the goat cheese mixture. They are a match made in heaven, for sure. 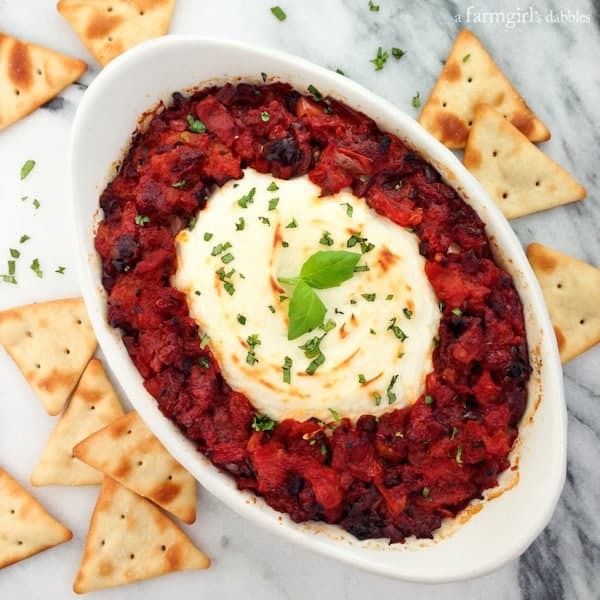 I like to serve this baked goat cheese dip with sturdy salted pita crackers, but buttery toasted crostini would be lovely, too. The warm cheese mixture borders on luxurious, so fun to spread. And even more fun to eat. Enjoy! With a mixer, blend goat cheese, cream cheese, and garlic powder until combined and creamy. Transfer to a small-ish baking dish (the dish shown in my photos is approximately 6″ x 8″, with 2″ high sides) and press the cheese mixture to the shape of the dish, leaving a 1″ gap between the cheese mixture and the sides of the dish. 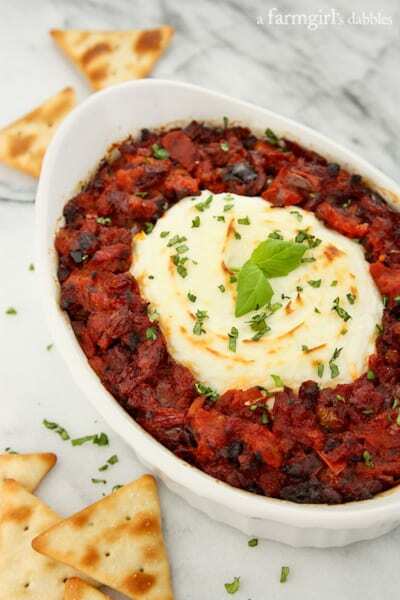 In a small bowl, combine fire roasted tomatoes, sun-dried tomatoes, and Kalamata olives. Spoon mixture around the edge of the cheese mixture, filling the gap around the perimeter of the dish. Bake for about 25 minutes, or until cheese mixture is hot and tomato mixture is bubbling. Set dish under broiler for a couple minutes to brown the top of the cheese. Remove from oven. Sprinkle with fresh basil and serve immediately with pita crackers or crostini.